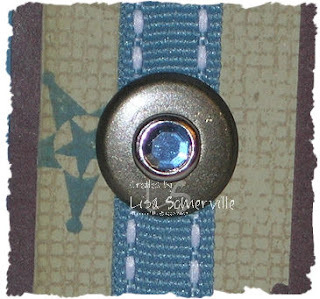 This weeks Bloggers Challenge was to use eyelets, brads or buttons on your project. I made a Z-Fold card (TJNL Online Bonus 08/07) and for my BLING, I added a Jumbo Eyelet with a Rhinestone Brad set inside. WOW, love those colors, great card. Thanks for showing the closeup of the brad within a brad. I like!! Great card Lisa. I absolutely love how you put the rhinestone brad into your eyelet. I'm gonna have to try that for sure. The colors are wonderful! This card is great! I love the rhinestone in the eyelet. What a great idea! Love the "blinged" eyelet -- what a great idea! I have to give that a go! Beautiful card Lisa! Love the Rhinestone brad in the center of the eyelet!! Wonderful! I would have never thought of doing the rhinestone brad inside the jumbo eyelet, but that looks awesome!!! Ooooooh, cool!! Love the bling! Super card, Lisa! Wonderful bling!! This is a really pretty card! Love the Bling! This card has a nice "rich" feel to it. What a great use of the large eyelet & the rhinestone brads. So totally elegant and rich looking. You are such an awesome stamper. I love all of your creations! Totally love the color combination. Looks awesome. Lisa! This has got to be one of my favorite cards! 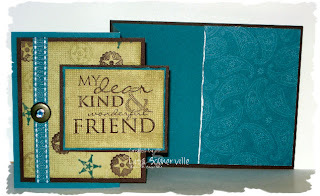 The color choices and the layout is fab plus...I LOVE the depth of the stamping with the background stamp choices!!!! GORGEOUS! Very pretty! Love the bling, but the colors really caught my eye too. I am just in love with this idea to combine the jumbo eyelet with a rhinestone brad - BRILLIANT! I love the brad in the large eyelet! Great idea. I also love Dracula Lou!! Just too cute. Fantastic! Love the color combination and the rhinestone brad/eyelet pair. Great card Lisa! 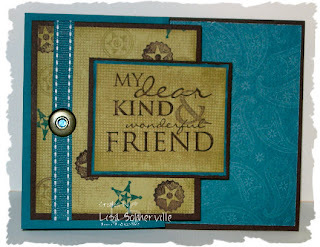 I love the colors you chose and all the texture that the background stamps added. Plus the rhinestone brad inside the jumbo eyelet looks so cool! What a great idea!